My circuit breaker won’t reset. What is the problem? What can I check for? This is one of the most common issues that can happen within the home’s electrical system. There can be several reasons that a circuit breaker won’t reset. First we must look at the function of the circuit breaker. A circuit breaker is designed to limit the current on a circuit to the rated level (measured in amperage) for which it, and the circuit is designed to operate at. A breaker is also designed to trip on a sudden and extremely high flow of current (short circuit) condition. 1. Are you taking the proper steps to attempt to reset the breaker? You must push the breaker handle firmly and fully to the off position, and then back to on. 2. An overloaded circuit. If the circuit breaker trips, and won’t reset immediately, but after a cool down period it can be reset, then trips again after a few minutes, then the problem is likely an overloaded circuit. Your circuit breaker won’t reset because you may have too many heavy loads plugged into receptacles or electrical outlets on that particular circuit. You may have too many lights on that circuit, or bulbs installed in fixtures that the wattage rating is too high. You may have a faulty appliance plugged into the circuit that is causing the problem. To troubleshoot the cause, start by unplugging everything, and shut off light fixtures, etc. Then if the breaker stays reset, start plugging in and turning lights back on until a problem becomes evident. 3. A short circuit. If the circuit breaker won’t reset, and trips immediately, then you probably have a short circuit condition. Take the same steps as above to attempt to isolate the cause. 4. It is possible, but much less likely that the breaker itself is faulty. It is important to remember that if the circuit breaker won’t reset, then it is likely a sure sign that you have a problem that needs attention. If your circuit breaker won’t reset, find out what is causing the problem. Never replace the breaker with one of a higher rating as a permanent or even a temporary fix. This can cause a dangerous condition of over-heating the wires, and possibly a fire. Once you’ve rectified the situation, you can try resetting the breaker. Here’s a link to my article that talks more about how to reset a tripped breaker and how to reset it, and includes a video demonstrating the process. I hope this information helps! Thanks for taking the time to read this article. If you have any questions or comments, please feel to share them below. Not Sure About Doing These Types of Projects or Troubleshooting? Not Anymore! Have you been stumped by a three-way switch, struggled installing a new receptacle, or basically put off doing any wiring project yourself because you didn’t feel confident working around electricity? I completely understand. Electricity can be downright scary. However, armed with the proper information you must have to work safely and completely, home owners like yourself CAN complete most simple home wiring projects. 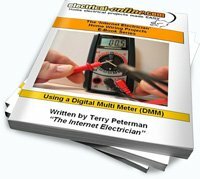 Rather than scour the internet looking for the information you need to work on a wiring project or problem, I can recommend a tremendous resource that pulls together virtually everything you will need to know. 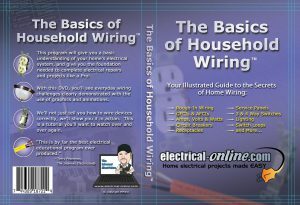 I don’t endorse many projects, but this is one that I fully endorse – “The Basics of Household Wiring” DVD or e-book. As I licensed, journeyman electrician, I have pretty high expectations for a DIY resource. It must be professional, it must be technically correct, and above all, it must focus on safety. I found all of that in this DVD, and I am confident that you will be impressed with the quality of the information contained in this excellent resource. This easy to understand (and no – you won’t need to understand technical “jargon”) tutorial breaks down the majority of home wiring projects you’ll encounter around the house and provides detailed, step-by-step instructions on how to complete them – safely and competently. This comprehensive, professionally produced DVD will give you the confidence you need to work on any of those home wiring projects! It’s a tool that I recommend every DIYer consider adding to their tool box! Click here for more information. This entry was posted in Breakers & Circuits, Q & A and tagged amperage, breaker, circuit, circuit breaker, electrical, electrical outlets, electrical system, electrical wiring, reset breaker, short circuit, tripped breaker, wiring. Bookmark the permalink.